It's one of the most wonderful times of the year for the banking industry's most lucrative business: credit cards. In the coming weeks, millions of Americans will reach into their wallets and use plastic to buy an estimated $100 billion in holiday gifts. But at what cost? In "Secret History of the Credit Card," FRONTLINE® and The New York Times join forces to investigate an industry few Americans fully understand. In this one-hour report, correspondent Lowell Bergman uncovers the techniques used by the industry to earn record profits and get consumers to take on more debt. "The almost magical convenience of plastic money is critical to our famously compulsive consumer economy," Bergman says. "With more than 641 million credit cards in circulation and accounting for an estimated $1.5 trillion of consumer spending, the U.S. economy has clearly gone plastic." But other consumers, like actor and author Ben Stein, use plastic purely for convenience. While it would appear that Stein -- who says he charges a small fortune every month on his credit cards -- is the ideal customer, in reality, he is what some in the industry call a "deadbeat." That's because he pays his balance in full every month. The industry's most profitable customers, the ones being sought by creative marketing tactics, are the "revolvers:" the estimated 115 million Americans who carry monthly credit card debt. Ed Yingling, incoming president of the American Bankers Association, tells FRONTLINE that revolvers are "the sweet spot" of the banking industry. This "sweet spot" continues to grow as the average credit card debt among American households has more than doubled over the past decade. Today, the average family owes roughly $8,000 on their credit cards. This debt has helped generate record profits for the credit card industry -- last year, more than $30 billion before taxes. According to Harvard Law Professor Elizabeth Warren, the credit card companies are misleading consumers and making up their own rules. "These guys have figured out the best way to compete is to put a smiley face in your commercials, a low introductory rate, and hire a team of MBAs to lay traps in the fine print," Warren tells FRONTLINE. Warren and other critics say that a growing share of the industry's revenues come from what they call deceptive tactics, such as "default" terms spelled out in the fine print of cardholder agreements -- the terms and conditions of which can be changed at any time for any reason with 15 days' notice. Penalty fees and rates are sometimes triggered by just a single lapse -- a payment that arrives a couple of days or even hours late, a charge that exceeds the credit line by a few dollars, or a loan from another creditor which renders the cardholder "overextended" as defined by the nation's three all-powerful credit bureaus. This flurry of unexpected fees and rate hikes come just when consumers can least afford them. "[Banks are] raising interest rates, adding new fees, making the due date for your payment a holiday or a Sunday on the hopes that maybe you'll trip up and get a payment in late," says Robert McKinley, founder and chairman of Cardweb.com and Ram Research, a payment card research firm. "It's become a very anti-consumer marketplace." But that's of little consolation to consumers who may be in trouble. According to the Better Business Bureau, credit card and banking companies are the subject of a record numbers of complaints. 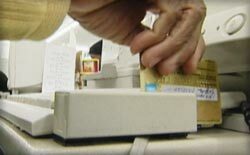 "It's not an accident that the banking and credit card business generates more complaints nationally, across the country, than any other industry…Out of one thousand industries that we track, they are number one," says Pat Wallace, head of the San Francisco Bay Area Better Business Bureau. "There are irritated, unhappy, dissatisfied customers in this industry." As Professor Warren sees it, the industry is operating without fear of penalty. "There's no regulator, and there's no customer who can bring this industry to heel," Warren says. The average American household is carrying a credit card balance of $7,500 - $8,000. What's yours? Note: As the producers of this report found out, it's hard to get people to talk about their credit card debt. But this poll is completely anonymous , so we invite you to answer honestly. "Revolvers" - they roll credit card balances over month to month, never paying in full. "Deadbeats" - they pay their balances off in full every month. "Rate Surfers" or "Gamers" - they shift usage between credit cards based upon interest rates. Despite the number of consumer complaints, the ability of state and local governments to investigate the credit card companies has virtually been eliminated. That's because the federal regulator for the banks that issue the majority of the credit cards, the Office of the Comptroller of the Currency (OCC) has been engaged in what some describe as a "turf battle" with the states. The OCC has fought aggressively in courts and Congress to nullify state consumer protection laws and curb enforcement actions, sparking a nationwide battle. New York state attorney general Elliot Spitzer has united with his counterparts from all 50 states in opposition to the OCC. "We get thousands of complaints every year about credit card issues…but increasingly over the past number of years what we have heard back from the major banks is that 'we don't need to deal with you.'" Is the OCC doing enough to protect consumers? Julie L. Williams, the acting comptroller of the currency tells Bergman, "We have a wide range of enforcement tools, and we have the ability to directly affect what the banks do." The OCC points to advisories they have issued to banks warning about unfair practices, but to date, none of these practices have been banned. Critics believe the OCC's primary mission -- to keep the banks sound and competitive -- helps explain its scant record of public enforcement actions to protect consumers. In Congress, Senator Chris Dodd has tried numerous times to introduce legislation to curb industry practices, but every one of his attempts has failed. Dodd says that the credit card industry "has become very, very powerful. And it's very successful in defeating every legislative attempt that's been made over the last several years to inject some responsibility on the part of this industry." Banking spokesman Yingling makes no apologies. "Those are bad bills," Yingling says, "and we'll continue to do our best to block them." In the meantime, consumers may find themselves on their own when it comes to dealing with problems with their credit card company.